I was invited to be a speaker on an event of the Portuguese Xamarin User Group. My talk will be a technical and architecture testimonial of what should we consider when we are building a big consumer APP with a disruptive design, using Xamarin as the development platform. The title off my talk is xamarin practices on big ui consumer apps and more then a testimonial it will be a discussion of patterns and architecture reasons to be consider when developing wow consumer apps using Xamarin Forms. In the last days i had been studying and coming back to the Xamarin plataform. Xamarin is a platform that allow us to create real world apps for different OS in just one instance and using all you already know from C#. Xamarin Templates in Visual Studio 2015 – Xamarim support for the Visual Studio 2015 Preview release. We will have Xamarin templates that make it easier to discover and download Xamarin from within the IDE. And Microsoft is now including templates for building iOS and Android apps with Xamarin directly in Visual Studio 2015. Free Xamarin Starter Edition for Visual Studio Users – Microsoft new free edition to Visual Studio—Visual Studio Community will support for extensions, which means it will be Xamarin compatible with from day one. Special offers for MSDN Subscribers – From a Xamarim source, Xamarim had worked with Microsoft to create a 20% discount for Visual Studio Premium and Ultimate MSDN subscribers to purchase Xamarin Business or Enterprise Editions, or world-class mobile development training with Xamarin University, available up to 60 days after the Visual Studio Purchase. 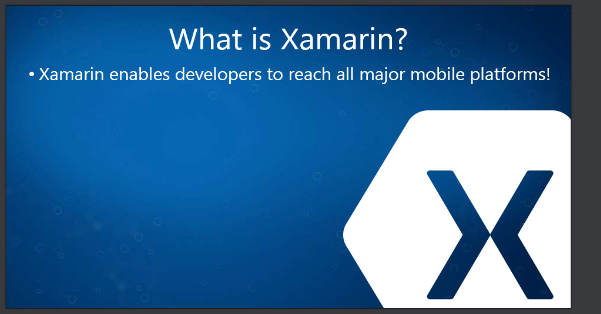 I really recommend to all Mobile developers or Windows platform developers to take a look in Xamarim framework, if you hadn’t yet, for the ones beginning to know Xamarim i recommend you the following slide deck introduction to xamarim by xamarim teams. As you can see the bigger secret of Xamarin relies in the Mono version of .NET runtime. This 2 years old technology are so solid that gartner had recognice him as a development platform for mobile application in their Magic Quadrant. In my opinion if we compare Xamrim with other platforms like appcelarator or phone gap, Xamarin as a more interesting integration and a real abstraction, in my benchmark this platform had proved also to generate more robust and efficient. At the moment i am preparing some workshops of Xamarin and also creating a new fitness app that uses Xamarin as the development platform, so soon i will bring you a little more information about this interesting development technology.